There's a reason why it's called the Shelby 1000. Is there ever such a thing as enough horsepower? 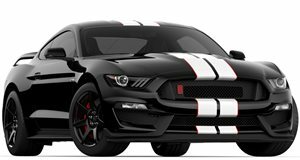 Apparently, that question was never asked by the folks at Shelby American, Inc. For those who thought that the 2012 Mustang GT500 Super Snake with 800hp wasn&apos;t good enough may find themselves satisfied with the 2012 Shelby 1000. Yes, &apos;1,000&apos; stands for horsepower. The track only version will produce more than 1,100hp, while the street legal version has approximately 950hp. To get the desired extra power, Shelby stated in their official press release they took Ford&apos;s 5.4-liter V8 "down to the block to add new rods, crank, and pistons. The team flows the heads, upgrades the cooling and exhaust, replaces the supercharger, tunes it and then sprinkles it with a little Shelby magic." In order to handle that added power, the Shelby 1000 also receives improved handling and stopping capabilities. This was done by adding 6 pistons in front and 4 pistons in the rear and the suspension features new struts, sway bars and bushings. There&apos;s also a new solid driveshaft that&apos;s connected to a new 9-inch rear end. Styling wise, Shelby added a more aerodynamic hood, rear panel and splitter, all of which are functional pieces. As expected, only a limited number of Shelby 1000s will be built. Each will be numbered and documented and will surely increase in value over the years. Interested? It&apos;ll certainly cost you. The Shelby 1000 package starts at $149,995, but that doesn&apos;t include the price of the GT500 donor car (around $54,995). So figure that a completed Shelby 1000 package will come in at around $200,000. Expect to see the Shelby 1000 revealed on the showroom floor of the New York Auto Show, which begins next week.